Thousands of restaurants launch every year, but only ten remarkable destinations can call themselves Canada’s Best New Restaurants. 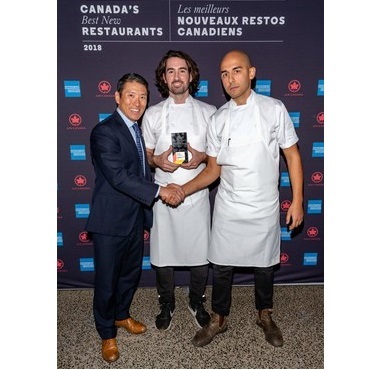 Today, Air Canada and presenting partner American Express revealed its highly-coveted Top 10 list with The Restaurant at Pearl Morissette from Jordan, ON, placing atop the list as Canada’s Best New Restaurant. Located in wine country on the Niagara Peninsula, The Restaurant at Pearl Morissette has two chefs who serve an ever-changing, multi-course menu of locally produced and foraged ingredients inspired by seasonal French cooking. Coming in second is wine bar Vin Mon Lapin in Montreal, the latest installment from the city’s Joe Beef team. Also hailing from Montreal is this year’s third place winner, Italian eatery Elena from the founders of hot spot Nora Gray. To create the list of Canada’s Best New Restaurants, a panel of industry experts considered every new bistro, pub and cafe to generate a delicious selection of restaurants for one writer to visit. 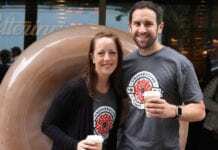 This took the writer on a month-long quest from coast to coast to coast, sampling cuisine as diverse as Canada itself. The contest is sponsored by, American Express, Acura Canada, Diageo World Class Canada and Nespresso. A sense of playfulness and adventure abounds in Canadian restaurants — chefs are serving serious food without taking themselves too seriously. An ice cream sundae is the prized dessert at Aloette, and hoser-classic Labatt 50 is on the drink list at St. Lawrence. Elena’s colourful jet-set décor hosts a pizza-focused menu groaning with puns, while Bündok, located in Edmonton’s hopping young Ice District, grooves to a killer playlist curated by its snowboarding chef. 1. The Restaurant at Pearl Morissette (Jordan, ON): Atop a massive black barn, the restaurant glows like a landlocked lighthouse on the Niagara Peninsula. The prix-fixe menu features ingredients largely grown or foraged from the surrounding land, with pairings drawn from the winery’s holdings and like-minded makers across the globe. 2. Vin Mon Lapin (Montreal, QC): The green of potted plants dapples the white walls of this Little Italy oasis, where stellar wines playoff layered flavours and textures. This spot serves a dazzling salad of endive, caramelized pumpkin seeds, pickled elderberries and shaved foie gras matches with the creamy minerality of a Loire Valley Domaine du Haut-Planty muscadet, while aromatic Jerusalem artichoke bread topped with sunflower crumble finds a partner in a sunflower butter. 3. Elena (Montreal, QC): To see what’s making Montreal buzz, step into the electric Italian-modern comfort of Elena, a pizza and pasta restaurant from the Nora Gray team. Chow down on pizza showered with six kinds of mushrooms, celery root and taleggio; and handmade tagliatelle with a robust pork and beef ragù. 4. St. Lawrence (Vancouver, BC): This cozy, teal-panelled spot excels at fat tranches of smoked-ham-studded pâté en croûte accompanied by two kinds of mustard and bottomless crocks of cornichons. A must try is the sautéed sweetbreads with mashed potatoes and morels that are doused with a deep, savoury jus. 5. Giulietta (Toronto, ON): Sip on low-alcohol amaro spritzes amid Italian-wool-covered walls, the hip and beautiful come to this west-end outpost for its combination of painstaking technique and robust, elegant flavours. They serve up a beautiful plate of fork-tender goat which undergoes a four-hour braise before appearing atop a creamy pool of polenta that tastes both of butter and chicken broth. 6. Aloette (Toronto, ON): The casual dishes served reveal a serious attention to detail: wedge salad with thin slices of avocado and a sprinkle of crunchy wild rice, pumpkin seeds and soy beans, torched scallops with wasabi peas and a burger enriched with brisket and pungent Beaufort cheese. 7. Avenue (Regina, SK): The super-tight chef-bartender team behind Ayden in Saskatoon touches down in a city centre heritage building. Their menu consists of tender seared Diefenbaker trout preens on a creamy bed of fresh peas, asparagus and three-grain risotto and a raspberry soufflé. 8. Bündok (Edmonton): Catch a chef on the rise at this dark-wood-accented downtown space. Don’t miss out on their glistening slices of fruity, olive-oil-painted sea bream crudo that are showered with diced apple and Thai basil, brought into vivid relief with orange flecks of bird’s eye chili. 9. Sand and Pearl (Picton, ON): Feast on Fogo Island crab legs, buttery lobster rolls on pain au lait and Manitoulin Island trout niçoise salad that pops with pickled green beans and lemony crème fraîche. Wash them down with Parsons Hula Hoop Sour beer or a Huff Estates pinot gris. 10. The Courtney Room (Victoria, B.C. ): Steak and seafood get dressed up at this serene Victoria sanctuary outfitted with a creative charcuterie cabinet. Their duck breast is aged for two weeks to deepen its flavours, then seared and nestled among Tokyo turnips and braised daikon – perfect with a plummy B.C. Lock and Worth merlot.